Being Caesar isn't easy, though: fail to bribe and bargain to ensure the welfare of the whole coop and today's Caesar is tomorrow's Coq au Vin. Dead roosters don't earn any more points, but they do offer opportunities for their surviving relatives to exaggerate their accomplishments. All that matters, in the end, is history's judgment, and history can be rewritten. 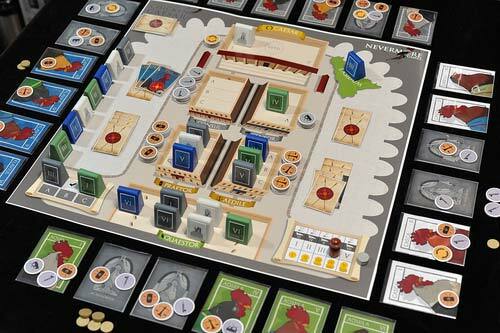 Chicken Caser comes with a board, tokens, and cards, but it’s your group that brings the game. You collect insignia by being elected into offices, and at the end of the game the more matching insignia you have the more coins/VP you get. All the while you and your fellow countrymen are attempting to balance the tax rate against chances of getting eaten by the fox. Each game runs about 30min-1hour. The systems in this game are merely there in instigate the real fun though. Almost everything is decided by a vote so, negotiation, bribing, and deception run rampant. Due to the games light theme stabbing someone in the back while trying to prove you are **** of the walk brings out laughter as opposed anger. I’ve played this game with someone who doesn’t like Werewolf because they fell they are getting picked on and even they had a good time. I’m never disappointed when I bring this game out even when I’m getting slaughtered. That being said I can see this game getting broken if everyone tries to “math” their way through every vote. I can also see that, like Lifeboats, this game could cause arguments. Overall if you like games like Battlestar Galactica, Werewolf, and The Resistance, Chicken Caser is a must buy. 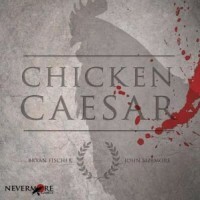 Add a Review for "Chicken Caesar"